Hi, I’m Carrie Schepens and together with my husband Shane we own Morgan Creek Montessori, a small preschool in South Surrey, and Beginning Montessori, an on-line toy company for infants and toddlers. We welcomed our daughter A. to our lives in February 2013. 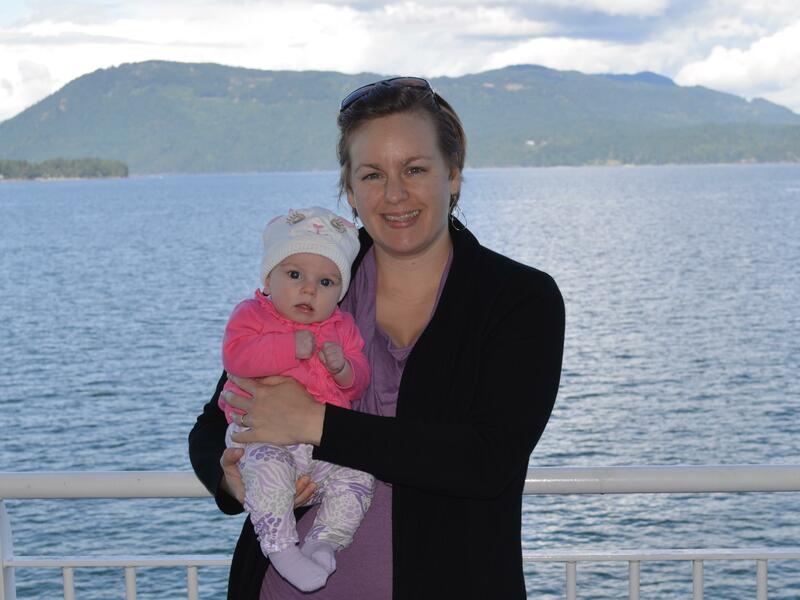 I grew up in the suburbs of Greater Vancouver (Coquitlam and Langley), moved away for university (Prince George where I met my husband and Calgary where I finished my undergraduate degree), and moved back to Greater Vancouver to do my Montessori training. We currently live in the suburb of Surrey. How were you introduced to Montessori and what led you to pursue your training? My parents incorporated a lot of the Montessori philosophy into my home growing up, both in their parenting style and the set-up of the home. I also attended Montessori preschool and elementary, so you could say I grew up with Montessori. During university I decided I wanted to pursue a career working with young children and of course I chose Montessori! In 2005 I completed my Casa training and worked as a directress for 5 years before stepping down to focus on administration of the school. The first Assistants to Infancy course was being offered in Vancouver in 2009 and I thought this would be a fabulous opportunity as I prepared to become a mother and provide me with the knowledge to offer parent-child classes when I (hopefully) expand my school in the future. How did the Assistants to Infancy training impact your life? The AtoI course was a very humbling experience. It was a lot of work and I had to accept so much help to get through it. I am ever grateful to my AtoI sisters, my trainers, and my husband who supported me through it. The course also completely changed how I saw infants. As I prepared to become a mother, having the knowledge from the course was immensely helpful! I knew how to prepare for childbirth, and how to prepare my home and myself for the arrival of my baby. I am very thankful that I took the AtoI course prior to becoming a mother. I believe I have been able to provide a calmer, slower paced home for my daughter with respectful interactions with her. I also now know the developmental stages she will go through so I know how to prepare my home and myself for each stage. What has been helpful to you as you implement Montessori at home with your child? I often asked our friend Rubi for suggestions of where to obtain different materials as she had recently sourced out many materials for her daughter. IKEA has been a great source to find furnishings. For inspiration and knowledge, I enjoy re-reading Kylie’s blog “How We Montessori“, “Understanding the Human Being” by Dr. Silvana Montanaro, and my albums that I made during my AtoI training.